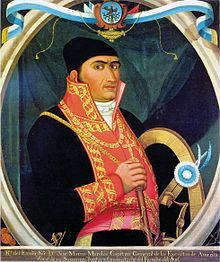 José María Morelos y Pavón (30 September 1765 – 22 December 1815) was a Mexican Roman Catholic priest and revolutionary rebel leader. He led the Mexican War of Independence movement. He led the movement after the execution of Miguel Hidalgo y Costilla in 1811. He was later captured by the Spanish colonial authorities. He was executed for treason in 1815, in San Cristóbal Ecatepec. Morelos was born in the city of Valladolid, which is now Morelia, Michoacán. This page was last changed on 25 November 2018, at 14:23.